Airing Out the “Dirty" Laundry is a catalyst for women’s voices, a call to gather together, opportunity to listen and to be heard, and to foster the love and understanding that resists hate and injustice. Laundry Day is a space and an opportunity for you to share your story by creating a piece of visual storytelling. Your (signed or anonymous) piece will be joined with the others on clothesline and become a part of all future and up-coming installations of Airing Out the "Dirty" Laundry in Charlotte and across the country. 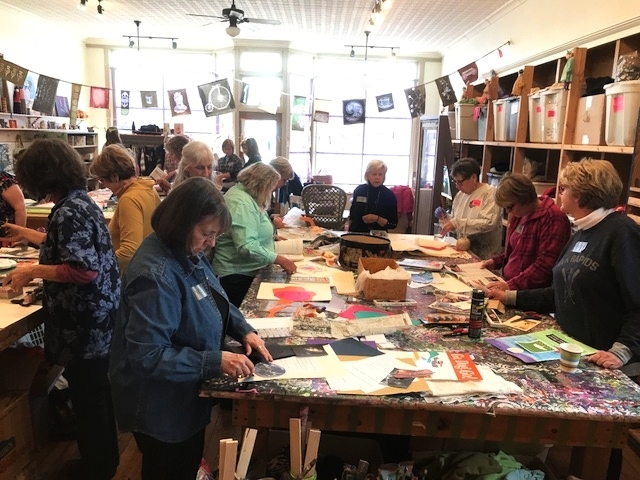 If possible, please bring an article of clothing, textile, pieces of fabric, letters, or papers that are significant and can serve as the base layer for your piece and that perhaps connects with the meaning of the story you will share. I will provide all of the other materials that you will need to create your piece. COME TO A LAUNDRY DAY! People who choose to create art pieces for the project may approach this effort from different lenses based on where they live, their personal experiences, their perspectives and their views and interests. Airing Out the "Dirty" Laundry embraces opportunities to connect with organizations, clubs, associations, higher education institutions, schools, church groups, civic groups, private businesses, cooperatives, and unaffiliated individuals who want to create pieces alone or together. Invite and gather a group together. Create a comfortable and safe environment for your group. Request that people bring materials to use and share with others. Chances are, you will not need to purchase any additional materials. If you are hosting, consider co-hosting with a friend and use this as an opportunity to expand your group of friends and broaden your sense of community. You are invited to create a piece in your space and on your own time. The suggestions below for how to begin will be helpful as you begin planning and working on your piece. Please mail your signed or anonymous story to PO Box 1161, Matthews, NC 28106. Please include a top layer to your "dirty" laundry by using either paper and/or fabric that is free-flowing and only attached (sewn, stapled, safety pinned, etc.) at the top. It can be transparent, semi-transparent, or opaque and it can layer over the entire piece or just specific portions. The top layer is an invitation for viewers to become a part of the conversation by understanding. The purpose of this project is to represent and value all voices and stories. You do not have to be an artist to participate. Your piece can be anonymous (even to the point of omitting your name on the envelope or box in which it is mailed when your piece is finished). This being said, please know that you are also welcome to sign your work if this is important to you. Why is the purpose of Airing Out the "Dirty" Laundry important and significant to YOU? When did you last feel unjustly treated as a woman*? What happened to make you feel that way? When did you last feel empowered as a woman*? What or who made you feel empowered? What do your relationships with other women* provide you with that nothing else does? How are those relationships different from your other relationships? What is going on currently or within the past year in our country and around the world that is making you feel angry, hopeful, horrified, etc. or any combination of feelings/reactions? Do you have an opinion or belief about something that you have not yet revealed to other people? Do you have something to say about believing in equality that you have always wanted to say, but never felt like you had an audience that would want to listen? Have you had an experience(s) that has defined how/why the purpose of Airing Out the Dirty Laundry is personally meaningful to YOU? The more personal your piece is, the more meaningful it will be to this project and to the people that will be viewing the installation. If you have questions about the process, please reach out to me at anytime and with any questions. I am here to support you through your process, to protect and share your story, and join it with the others in future Airing Out the "Dirty" Laundry installations. Please mail your piece to me at PO Box 1161, Matthews, North Carolina, 28106 and contact me at any point in the process if you have questions.